In 1990 Paul Nation was the main impetus behind a new focus on vocabulary with his book Teaching and Learning Vocabulary. This book fore the first time offered a principled approach, notably arguing that the study of vocabulary frequency is the best way of organising a course. Vocabulary acquisition now has a central role in the field of Instructed Second Language Acquisition (ISLA). Nation (2013) estimated that over 30% of all the research on vocabulary was published in the previous 11 years. It is unclear how vocabulary is stored and processed in the 'mental lexicon', but vocabulary knowledge is not just about knowing words, it's about having all sorts of knowledge about words and having connections between them. Learning one item has an effect on learning others (Meara & Wolter, 2004). 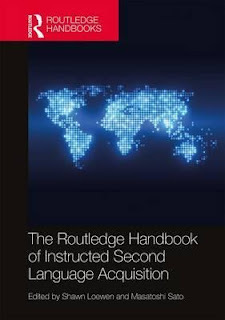 Evidence shows that L2 vocabulary learning is not just about integrating new knowledge into the existing L1 knowledge, but establishing new connections through exposure to words in varying contexts. In short, the more contacts you have with a word, in varying situations, the better you will remember it. The authors summarise Nation's (2013) framework regrading what 'knowing' a word means. This includes the word's form (e.g. spoken, written, word parts), its meaning (e.g. what it refers to, its associations, collocations - what it goes with - and grammatical functions) and its use (e.g. what words can you use with it, when can you use it). Word knowledge includes both breadth and depth (Anderson & Freeman, 1981). These can interact, e.g. the more words you know, the more examples of word parts like prefixes and suffixes you will know - so breadth develops depth. Breadth usually develops before depth, meaning that beginner and intermediate students have more difficulty putting sentences together. In addition, the distinction is made between receptive and productive knowledge. The former unsurprisingly develops first. One study (Nemati, 2010) found that receptive knowledge may be five times greater than productive. So students typically recognise words but cannot recall and use them. Research suggests that learners require anything between 2000 and 7000 word families to hold everyday conversations. To understand spoken narratives you need to understand around 95% of the words, e.g. van Zeeland and Schmitt (2013). One issue obvious is that such percentages do not take account of lexical phrases (chunks) or well known formulaic phrases, of which there are many. The authors point out that vocabulary acquisition is an incremental process. Different aspects of word know;ledge are learned at different rates and more research is needed on this. Some aspects seem to be learned in order, e.g. Schmitt (1998) found in a study of 11 words that spelling, derivative information, associations and polysemy were acquired in order). Webb (2007) found that aspects of word knowledge were acquired in parallel but at different rates. In addition aspects of word knowledge are picked up gradually, along a continuum ranging from zero knowledge to precise knowledge (e.g. Henrikson, 1999). Finally, receptive mastery precedes productive mastery. One researcher (Fitzpatrick, 2012) found that aspects of vocabulary knowledge can regress. Formulaic language consists of idioms, lexical chunks and collocations. In English it has been calculated that these occupy between a third and a half of all conversation (Conklin & Schmitt, 2012). The writers naturally conclude that both isolated words and formulaic language should form part of vocabulary teaching. This means picking up words where vocabulary acquisition is not the main goal. Learning occurs with little conscious effort (e.g. Hulstijn, 2001). Lots of learning occurs this way, although uptake can be slower and more uneven. This is because the number of exposures needed to learn 'unconsciously' is high. As a rule of thumb 8-10 exposures are thought to be necessary for students to be able to get words right in tests. Other researchers have come up with lower figures. Research suggests that incidental learning through listening requires more exposures (e.g. van Zeeland and Schmitt, 2013). Nevertheless listening tasks are a good source of incidental vocab learning. In both listening and reading high frequency words are more quickly acquired than low frequency words. This means deliberate attempts to learn new words. This can be through direct instruction such as call and response flashcard work, matching tasks, gap-fill, or through personalised learning from lists. As mentioned above, there is research to suggest that intentional learning is more efficient (e.g. Webb, 2007). Laufer and Rozovski-Roitblat (2011) found that intentional exercises (practising words out of context, synonym and antonym work, selecting the right meaning from options, writing the words in sentences) led to better recall, both short and long-term, than incidental approaches. Bilingual word lists and flashcards have been found to be useful. Meaning-focused output (e.g. writing new words in sentences) is also supported by research. Other research suggests that the best approach is to combine intentional with incidental learning, where the latter reinforces the former. You'll be unsurprised to learn that the authors provide research evidence for the value of recycling words. Mutliple encounters lead to greater all round knowledge of a word, breadth and depth of knowledge (see above). 4. What does this mean for the teacher? Vocabulary acquisition requires multiple encounters with words and chunks and some teachers may need to spend more time on this in a planned way. Vocabulary should be prioritised (ahead of grammar?). Provide rich and varied language experiences through the four skills, including through independent work beyond the classroom, e.g. homework. Provide multiple encounters with words, compensating for any lack thereof in textbooks. Teach strategies for independent learning, e.g. explain how students can use morpheme clues, infer from context, use dictionaries and so on. Foster the active engagement of students in vocab learning - promote interest and involvement. Extensive reading and listening will help develop vocabulary. Graded readers are a good idea. For collocational knowledge and restrictions on use massive exposure is needed - provide as much as possible at higher levels. Consider setting awkward words for learning before the class so that they are better understood when seen in context. As is uniformly the case in this handbook, the theoretical, research aspects are far better dealt with than the teacher tips. This is true of the end their chapter where they quote from Nation's (2007) four strands of successful vocabulary teaching. Nation recommended that time be equally shared between the four strands. Good general advice, but fairly limited on specific classroom tasks. a. Provide lots of meaning-focused input (reading and listening). b. Provide opportunities for meaning-focused output (speaking and writing). c. Include form-focused instruction - direct teaching of word forms, sounds, spellings, grammatical features, gender and so on. d. Provide fluency-focused tasks, e.g. skimming and scanning, timed writing and speaking, speed reading. If you wish to try to follow up any specific references try googling my abbreviated ones above. Most will not be open-access. My reference here has been Chapter 16 of the Routledge Handbook of Instructed Second Language Acquisition (2017), Loewen and Sato, eds. Thank you for the thoughtful summary!